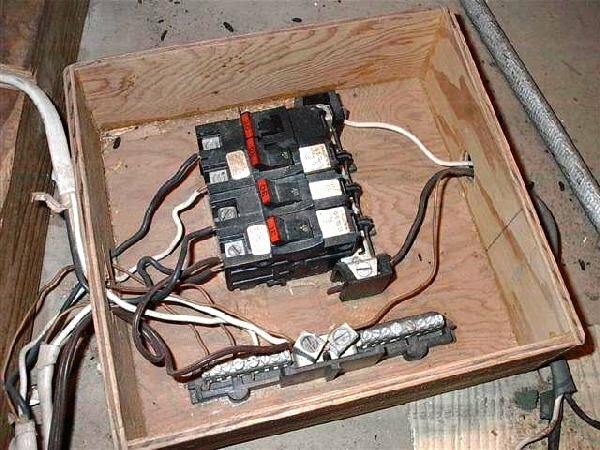 Register Log In ECN Forum Forums Violation Photo Forum Free Electricity Found in Attic! No need to bond the enclosure huh? Was this found connected to service conductors? Yes, the homeowner tapped into the Type SE cable and wasn't caught for 30 years! The zip cord was interesting and the load on them was probably not considered because of the type of circuit breakers that were used, if you know what I mean! -IF the point of first disconnect is the "main" panel, and everything after a "sub" panel, what would we call a panel BEFORE the main panel? Perhaps I should coin a new word: Diy. As in DIY. Pronounced "die." A Diy-panel. Installed by a diydiot. At Least The DIYIDIOT built an enclosure,,and whats so wrong with the FPE breakers!!! !They make great arc welders!! Well it worked OK for 30 years. It must be OK.
That's the second one of those that's been posted here. Anyone remember another one of those "cigar box breaker panels" that had scorch marks inside and was sitting on a sheet of some fire-proof insulation? A wooden box~~~makes a great 'panel'. Everyone should have one of those.....NOT! How was this done for 30 years and NOT noticed? "Live the dream, you only get one chance."